Visualising law, as the authors are attempting to do in this book, gives the reader some idea of what the blueprint of the edifice of European Union law looks like. The book contains 298 EU law-related charts (primary, secondary and case law) dealing with the following issues: introduction to the subject, the development of European integration, the institutions, competences of the EU, the adoption of secondary measures, the nature of EU law, introductionto substantive EU law, the internal market, competition law, social law, legal integration and enforcement. Firstly, the charts are intended as a learning tool for students as well as for practitioners endeavouring to brush up on their EU law skills. Indeed, most people understand and memorise complex or abstract content more easily if they have some form of visual aid at their disposal. Secondly, these charts are intended as a presentation tool. Whether lecturing on EU law in a university, explaining an issue of EU law to a client or making a presentation before the board of directors of a company, visual tools can be highly useful. This book is accompanied by “Essential EU Law in Text”, which is based on the charts and refers to them.Christa Tobler is a professor at both the Universities of Leiden (the Netherlands) and of Basel (Switzerland), where she teaches EU law. In her research, she places a particular emphasis on the issues of legal equality and discrimination, both in economic and in social law, as well as on the legal relationship between Switzerland and the European Union. Jacques Beglinger is a lawyer and member of the executive committee of a business association in Berne (Switzerland). He received his legal training in Switzerland, France and the United States. His background is in industrial law with a specialisation in international commercial law including, in particular, the areas of technology, digital economy and media. This volume is associated to the Meijers series of the Meijers Research Institute and Graduate School of Leiden University, the Netherlands. 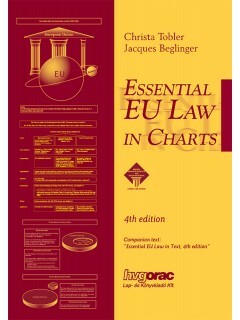 This book is a product of the “EUR-Charts - EU Law in Charts” project (www.eur-charts.eu). * A csomagkedvezménnyel egyidejűleg további kedvezmény nem vehető igénybe. A csomag egyes kötetei viszont külön-külön megvásárolhatóak törzsvásárlói, diák és JogTudor kedvezménnyel!